I didn't know I was doing it—honest! I was photographing them everywhere I went. 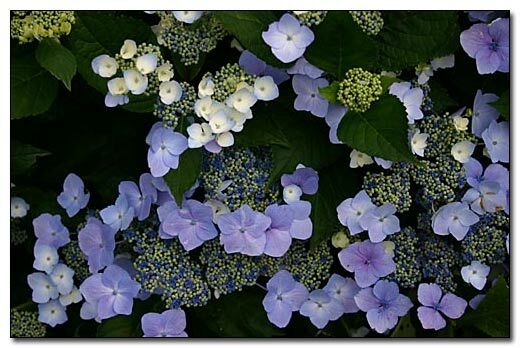 They crept into my image database; before long, I had a huge collection of hydrangea photos. 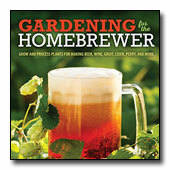 I didn’t know what to do with so many, until I had the time to get to them into the Plant Growing Guide. I decided to share a few here and let you judge which ones you like best, because 'Little Honey', I can’t decide. Originally bred as a pot plant, the lacecap Hydrangea macrophylla 'Fasan' also thrives in the garden. This shrub has deep blue flowers in acidic soil, or deep reddish-pink when grown in alkaline soil. Who is this hydrangea with the honey golden leaves that turn red in fall and gives us red winter stems? 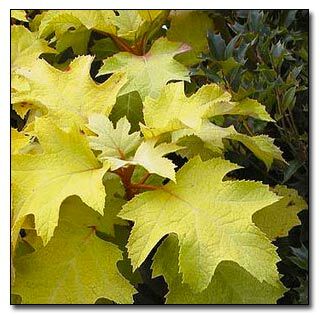 This is the oakleaf Hydrangea quercifolia 'Little Honey' discovered as a sport of H. 'Pee Wee' in Olympia, Washington in 1999, and just as short—three feet tall. 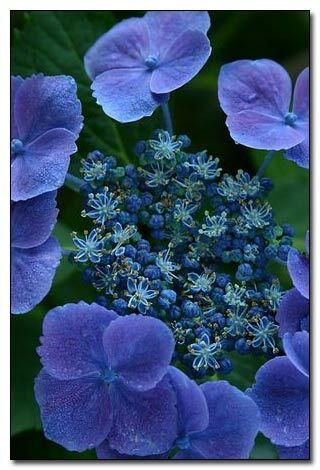 This lacecap is a 1904 introduction—Hydrangea macrophylla 'Blue Wave'. 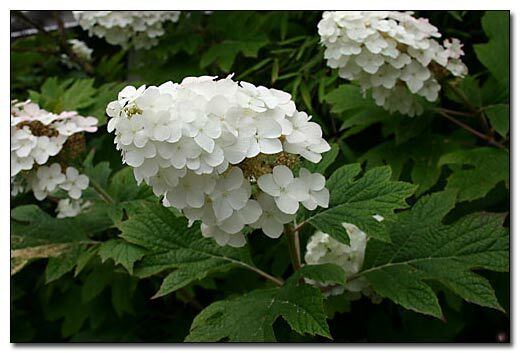 Here is another example of an oakleaf hydrangea and considered one of the best, with stems full of white flowers—Hydrangea quercifolia 'Snow Queen'. 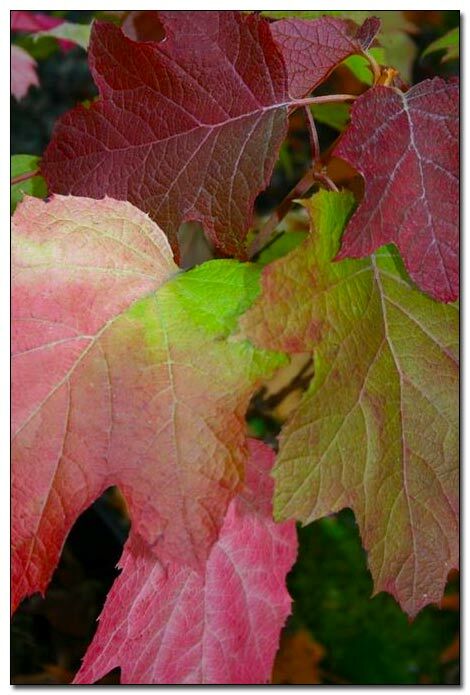 I didn't take a picture of the flowers from the oakleaf Hydrangea quercifolia 'Alice', but the autumn leaves give a vibrant show if the shrub is planted in full sun. The 10-14 inch long stems are covered in flowers, making this one definitely worth growing. The shrub is especially adaptable to container growing. 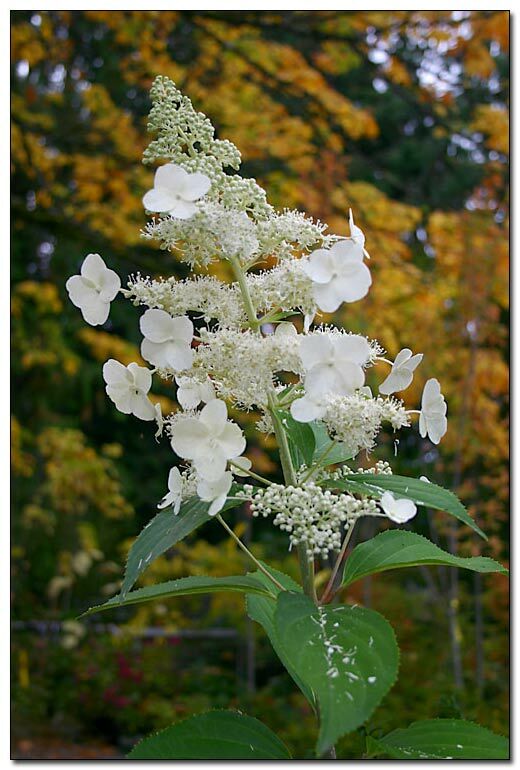 Hydrangea paniculata 'Kyushu', has upright stalks of flowers, although not as showy as previous hydrangea flowers; however, the up-righteousness may win you over.